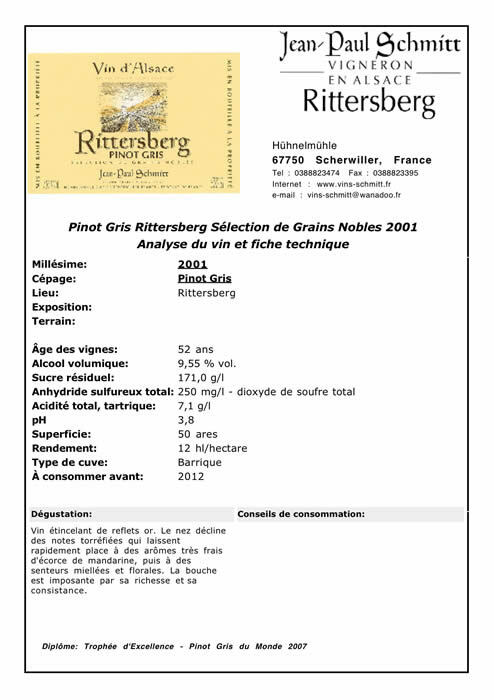 After winning the gold medal at the international wine competition 2006 for our Pinot Gris Sélection de Grains Nobles 1999 we received the precious Trophie of Excellence at this year's world competition Pinot Gris du Monde 2007 for our Pinot Gris Rittersberg Sélection de Grains Noble du millésime 2001: with 99 from 100 points. Wine with sparkling golden reflexions. The nose can taste the roasted notes that make immediately place for the still frech aroma of mandarine seeds. Followed by a smell of honey and flowers. In the mouth this wine impresses by its rich concentration. - Félicitations! Superbe! Bingo! Remarquable! - Robe très intense, très grande matière, complexe, attaque souple, nez très fin boisé: vanille; très bonne acidité. At our wine shop at the Hunelmuhle in Scherwiller you may taste now all our exceptional wines. Open from Monday to Friday from 8:30 - 19:00 and Saturday and Sunday from14:00 - 19:00 hrs. 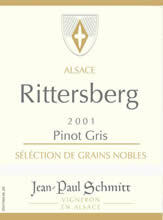 an certainly all other outstanding wines of Jean-Paul Schmitt. 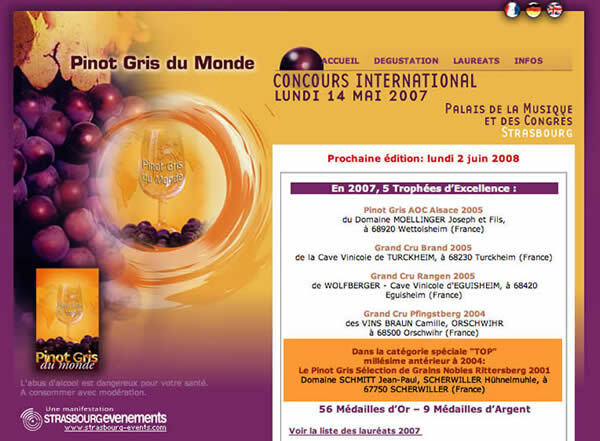 Quantité limitée: please note that there is only a limited quantity available for all wines winning awards. We are looking forward to seeing you for a wine tasting in Alsace!